Yes, you read the title right- pumpkin carving through labour is just what happened on October the 15th this year. I woke up at about 4.45 am with the first official pain, though it wasn’t enough to make me start panicking. 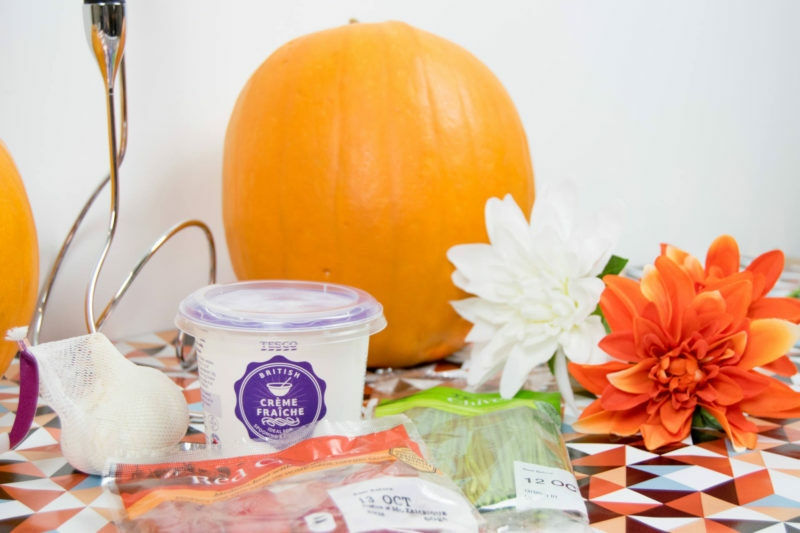 I had a plan for the morning, and that was to make a fabulous spiced pumpkin soup* with fresh chillis and creme fraiche. I woke Paul up a few hours later after several more contractions, they were quite far apart and so I didn’t want to make a big deal out of it, knowing that this could potentially start and stop throughout the day. So I carried on as normal, and fortunately the pains stayed about 20 mins apart while I got stuck in with my soup making in the kitchen! 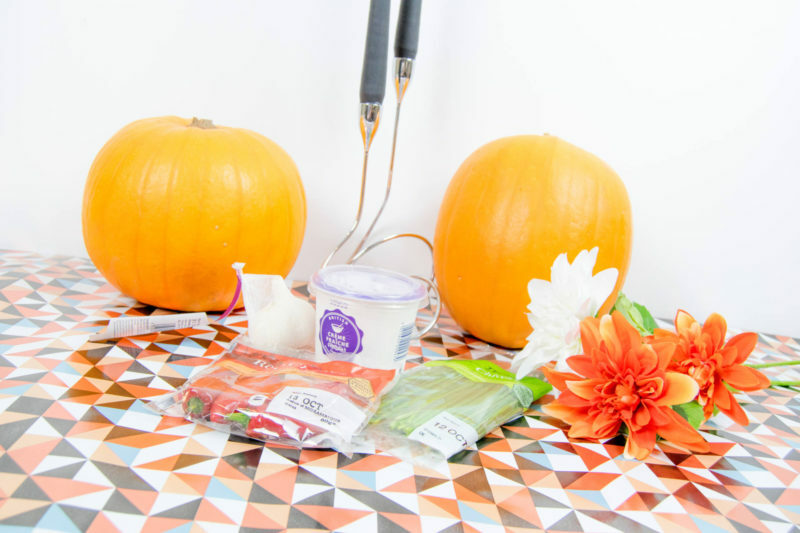 It’s a really simple bunch of ingredients and utensils which you can put all in one pot so minimal mess and effort! 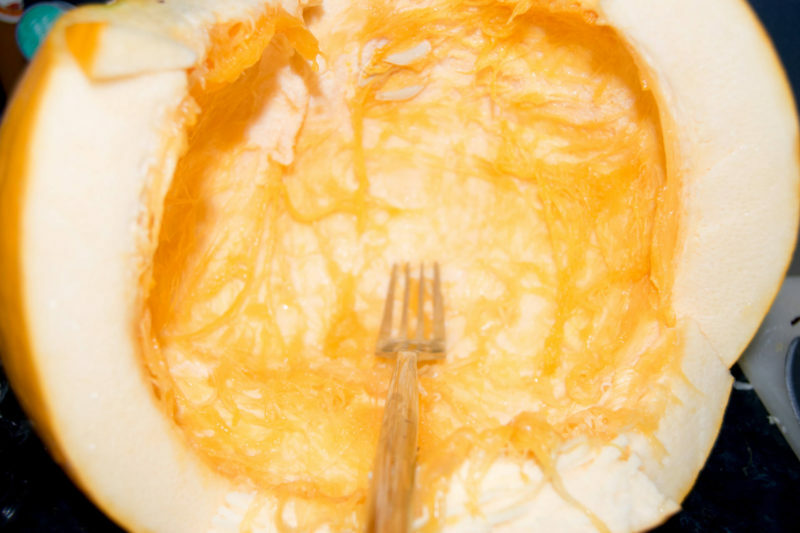 The hardest part is beheading the pumpkin and scooping out the insides. Tip: once the insides are out, wash and keep the seeds and bake them in the oven for 30 mins with some oil and sea salt for a yummy snack/ great soup topping! 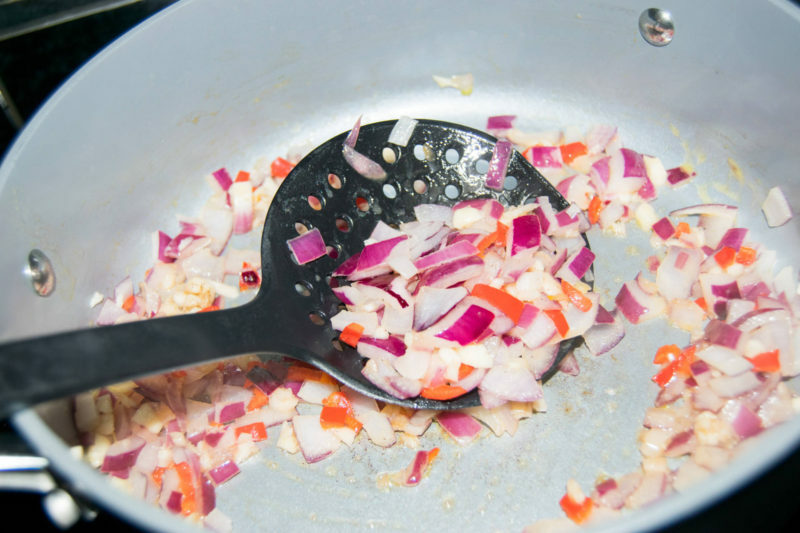 So first, get your onion, garlic and chillis (de-seeded) and fry them up in a dash of oil. 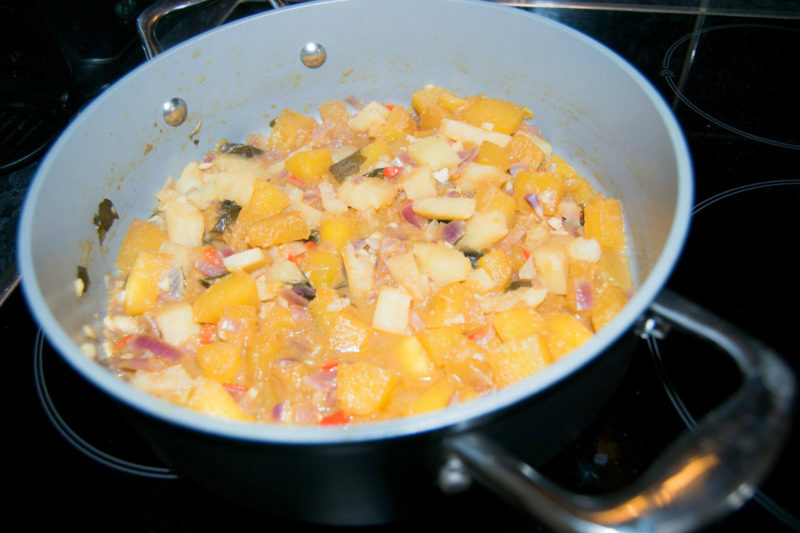 Once nice and sizzling, add in diced pumpkin and potato cubes. Remember to keep the cubes about the size of your stock cube so it’ll cook quicker and blend up easier. 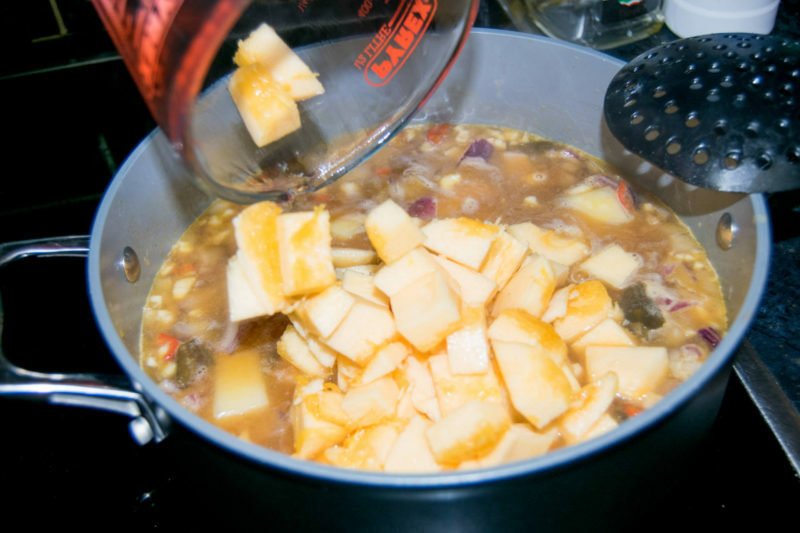 Add in the stock cube with enough water to cover the ingredients. Let that hubble bubble away for around 20 mins or until your cubes are nice and soft. Take off the heat and let it cool before blending up. 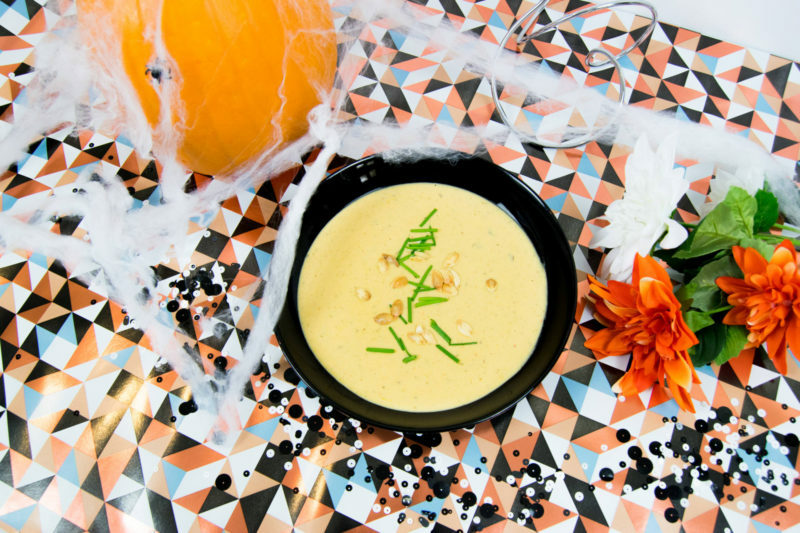 You can leave a few pieces to the side if you prefer a chunky soup to a smooth soup. 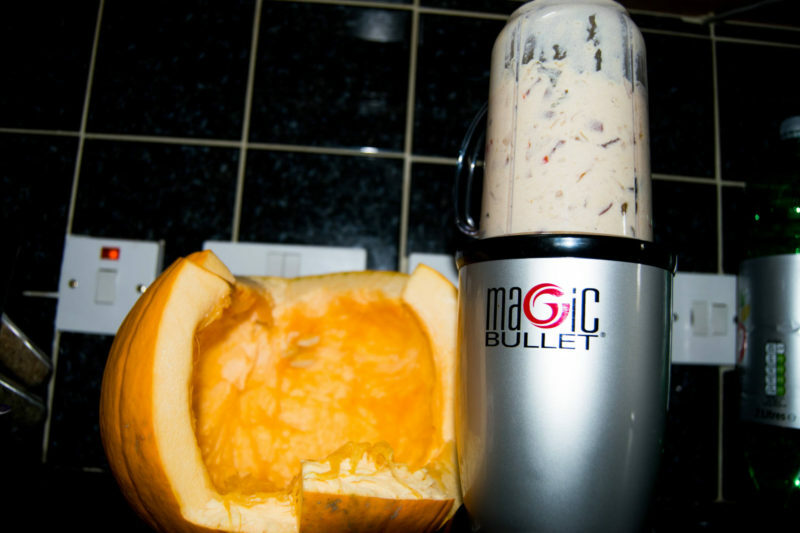 I used my Magic Bullet about 4 times to blend up all the pieces, and I made sure to include the liquid too as you don’t want to waste that flavour. 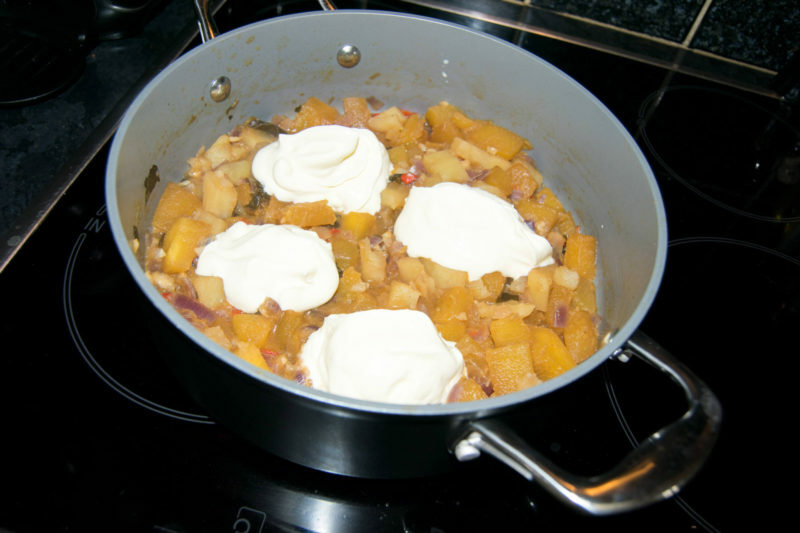 It all goes back into the saucepan with 4 tablespoons of creme fraiche then salt and pepper to taste. Let that come to a boil slowly as the consistency will be quite thick, so you don’t want a sudden spurt and burnt fingers if it starts getting feisty! 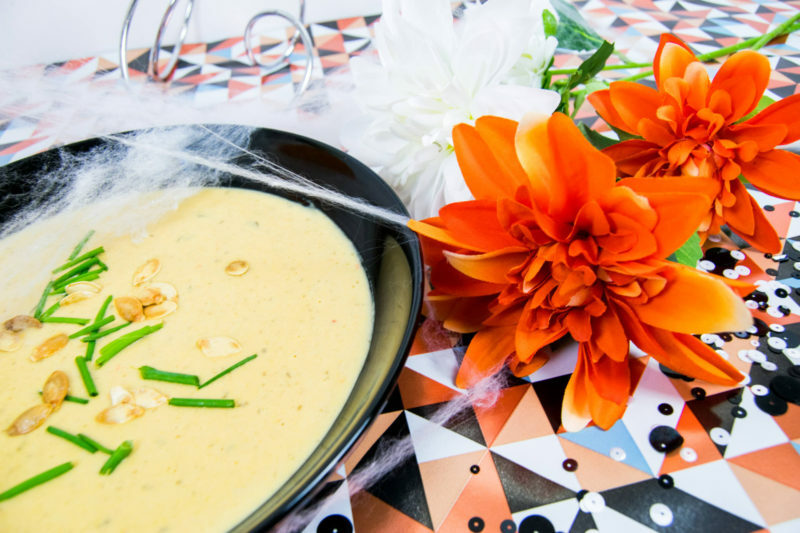 For the final touch, chop up a few chives and add some of the baked pumpkin seeds before you dish up. I managed to have a lovely bowl of my soup for lunch before my contractions started to get more intense- and about 12 hours later Alice was born! 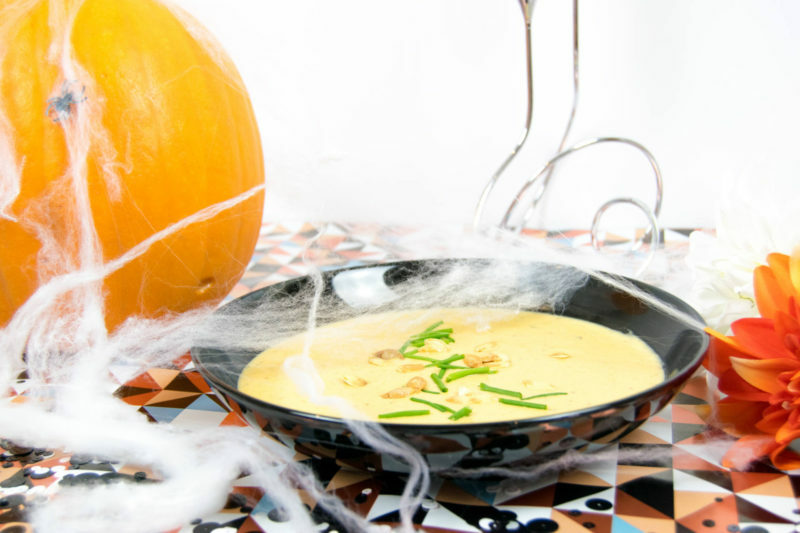 Definitely a recipe to remember, and I shall be making it as a reminder of my pumpkin carving through labour each Halloween! See my latest fashion piece in collaboration with PrettyLittleThing! This October has been one of the most incredible Octobers of my life. Not only did I have the most fantastic 27th birthday with my family, it also brought and end to my pregnancy and welcomed a brand new arrival! I’m sure you have seen by now that I gave birth to a beautiful baby girl who we called Alice Iris. It’s been a tough first week to say the least, and I thought that this would be a great opportunity to talk about being brave- in more than one aspect of life. 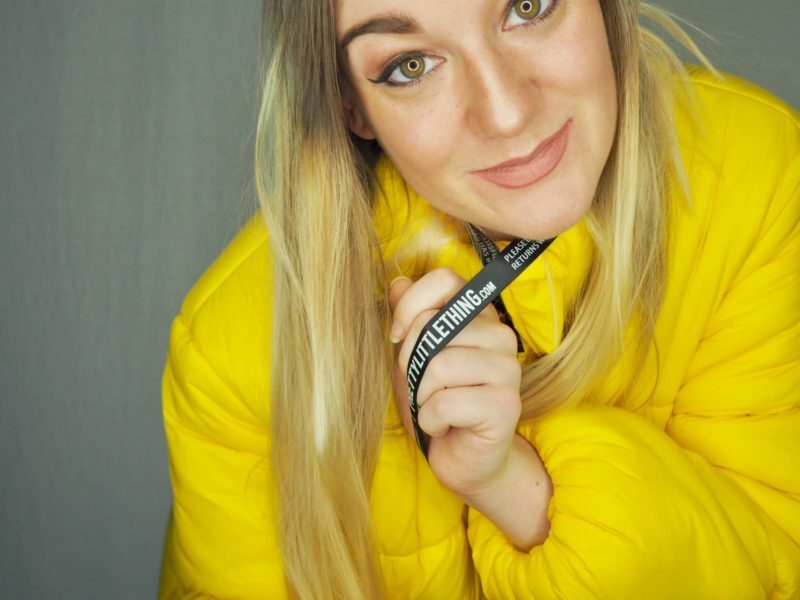 Having the courage to stick with your guns and make your unique voice heard is such an important thing, so here is my piece on simplistic styling and brave choices featuring PrettyLittleThing. I feel that I have grown up a confident person, always going for what I want in life. Even at school I remember being the one always speaking out and eager to have my say, so having strength and courage definitely stemmed from a young age. Confidence and being brave may not come naturally to everyone, but I’d like to try and persuade you to come out of yourself just that little bit today. Whether that means doing that task you’ve been putting off for days or saying something you have been holding back from someone close to you- I say you are going to do it! And once you do, you’ll feel amazing. So, how does being brave work it’s way into another part of your life- your wardrobe? 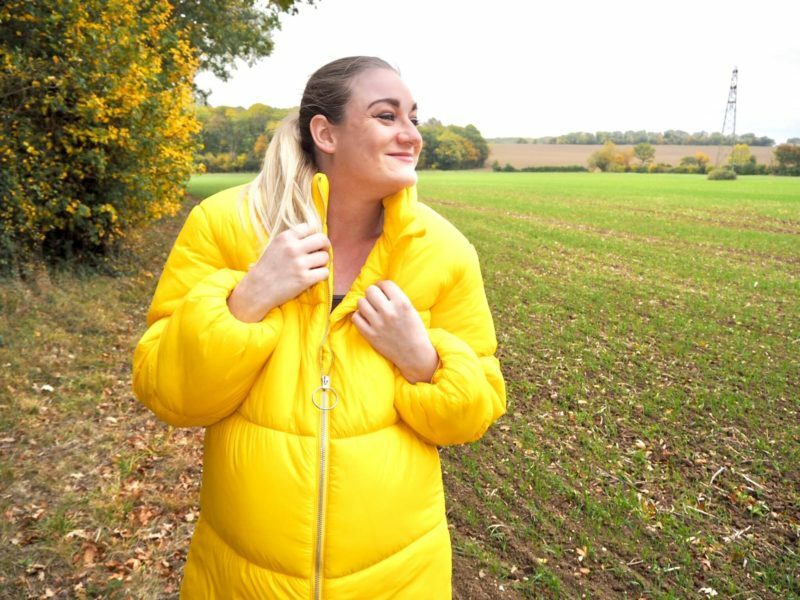 PrettyLittleThing are here to help with their new season coats and jackets range. 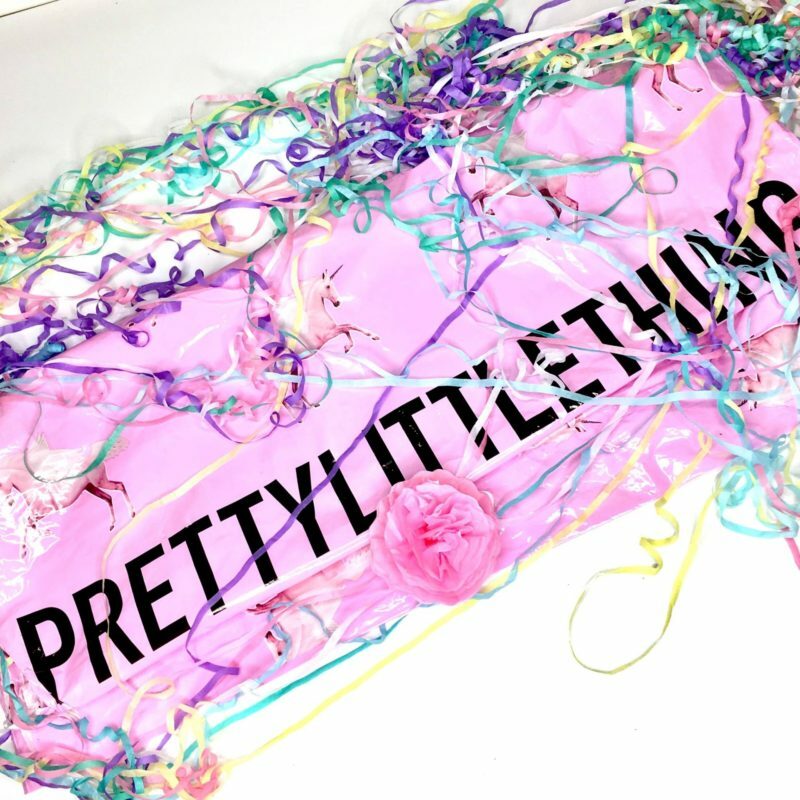 PLT are one of my favourite brands, so getting to collaborate with them on this project was definitely a big fat tick off the blogger bucket list. I did this shoot two days before giving birth, so this will definitely be one of those memorable weekends not only for my blog but for my family too. 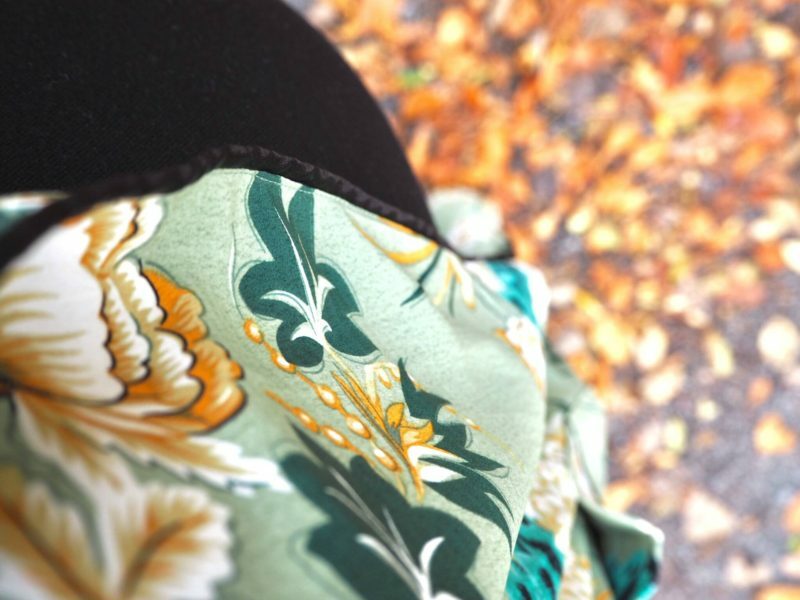 This sage green floral maxi kimono worked effortlessly with one of my plain black dresses. 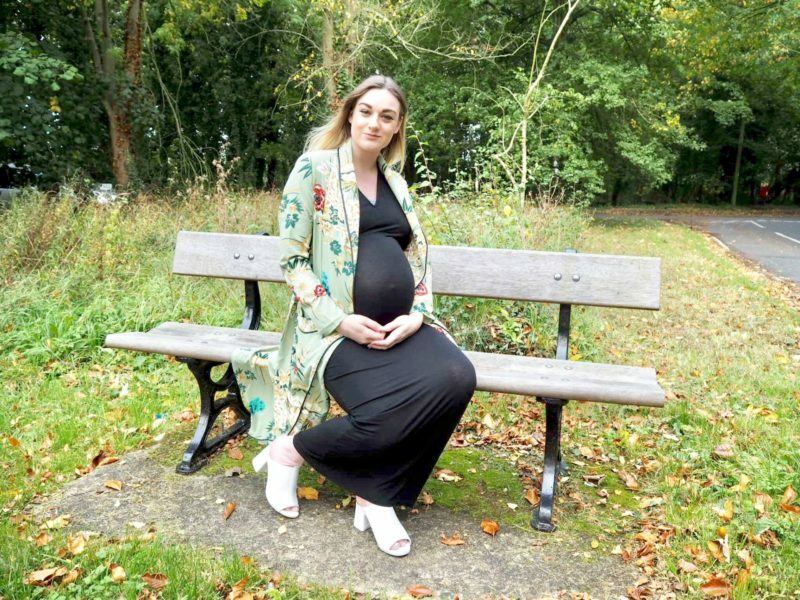 Pregnant or not, it’s a simplistic style for anyone not wanting to brave a whole new wardrobe just yet. 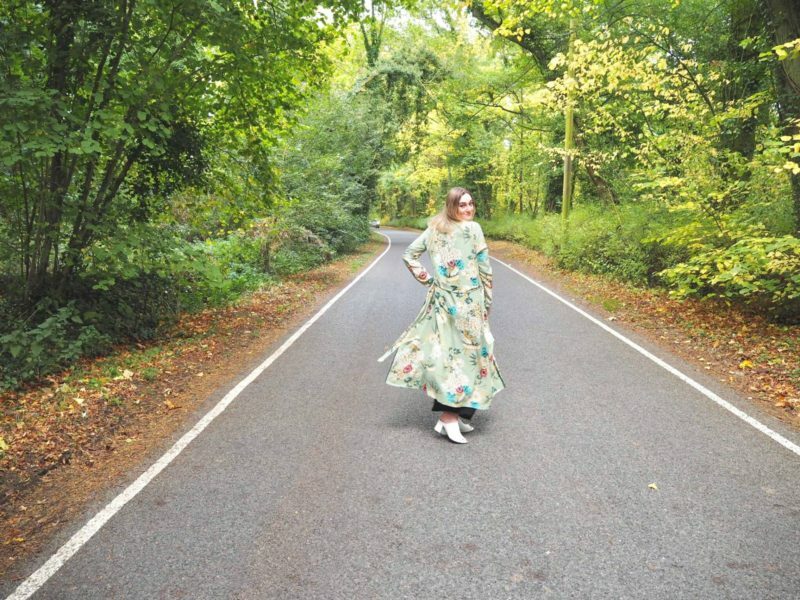 Just one stunning jacket like this can make you feel confident and ready to take on anything life throws at you- you’re in a kimono for god sake, rock it!! 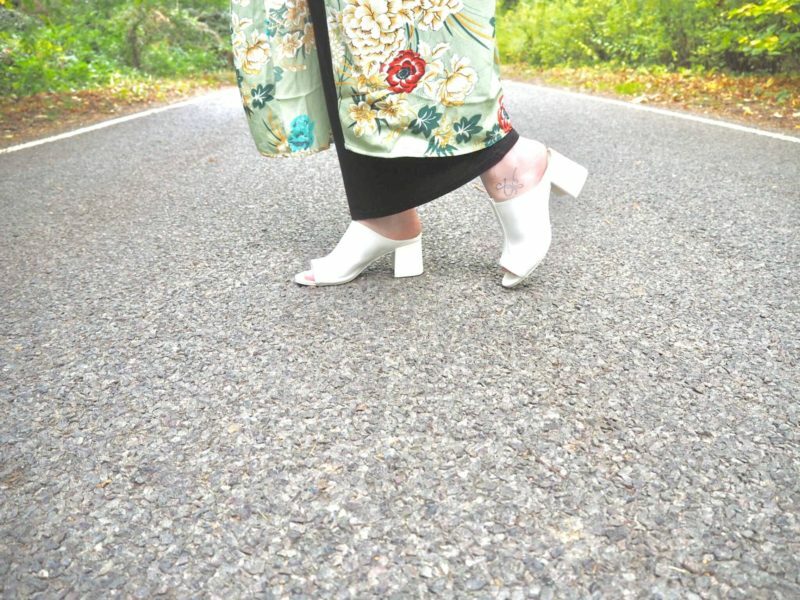 Much like this kimono, I took the leap of faith and braved my labour without any pain relief. We did it together, Alice and I, along with some super support from my husband, sister and mother. I took my strength during labour by focusing on all the reasons why I was doing it, and who I was doing it for. The list was long- my husband and my late mother in law who she is named after were the top two faces in my mind- and it worked brilliantly. Being brave for another person I find boosts your confidence levels like nothing else- I’m sure you can remember exactly how you felt at a time where you have stood up for something or someone that you believe in- it gives us that fire and purpose. This next coat was a little out of my comfort zone, but I just had to jump in with two feet. 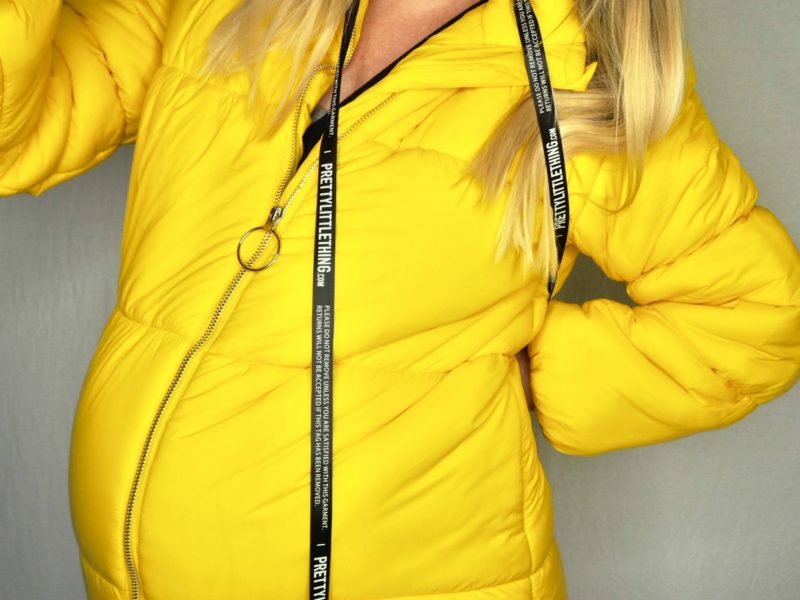 That item you’ve been looking at online but not sure it’s ‘you’, just go for it, just like I went for this bright yellow longline puffer jacket. Again, I’ve paired this with black which is a smart choice for anyone out there struggling with splashing colour into their autumn winter collection. 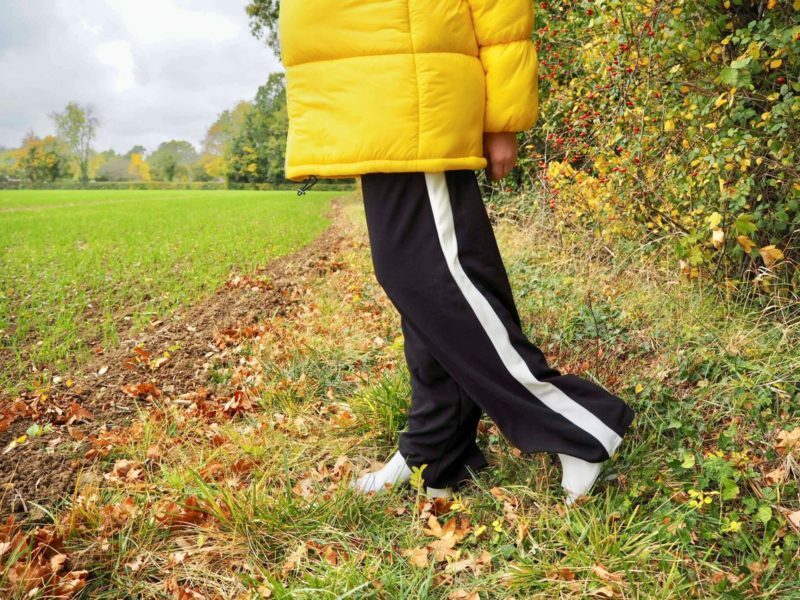 Sporty stripes are heavily trending throughout the high street, so a pair of wide leg stripe trousers like this create a cool but chic balance to the powerful puffer. 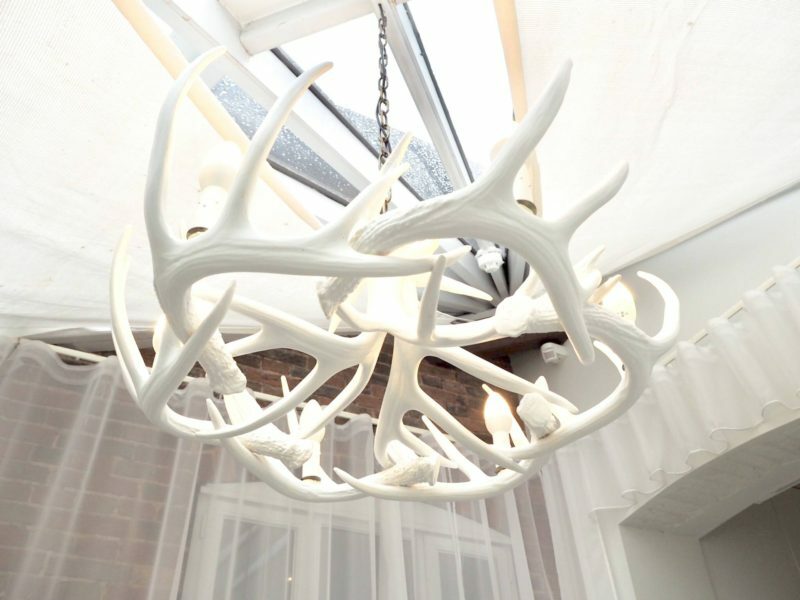 Simplistic styling and brave choices go hand in hand- it’s just one small change that makes a lot of difference. Tell me about a time you made a brave choice in the comments below- and for this week I want you to face any fears you have (wardrobe or otherwise) with a deep breath and a strong focus. You won’t get a baby at the end of it, but you’ll be self rewarded with a new found sense of accomplishment! 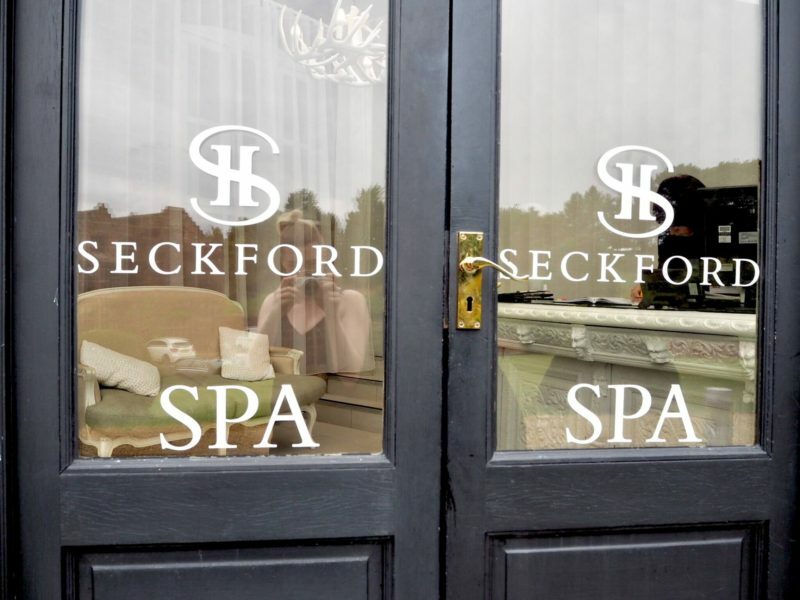 Find out all about my experience at Seckford Spa with a pregnancy massage! It’s been such an up and down ride this year for many reasons. Mostly due to the fact that I’ve been pregnant for the majority of it! 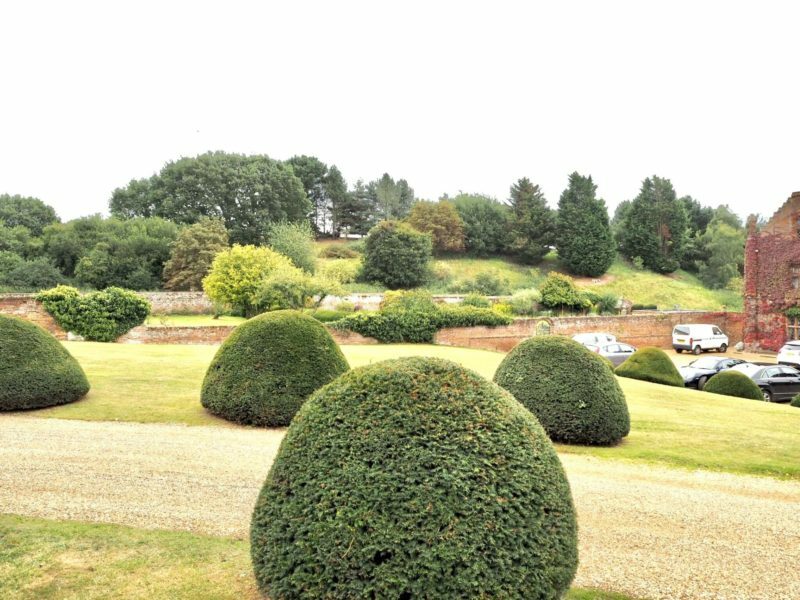 I decided to take Paul to Seckford Hall’s Spa for his birthday last month which we really enjoyed. 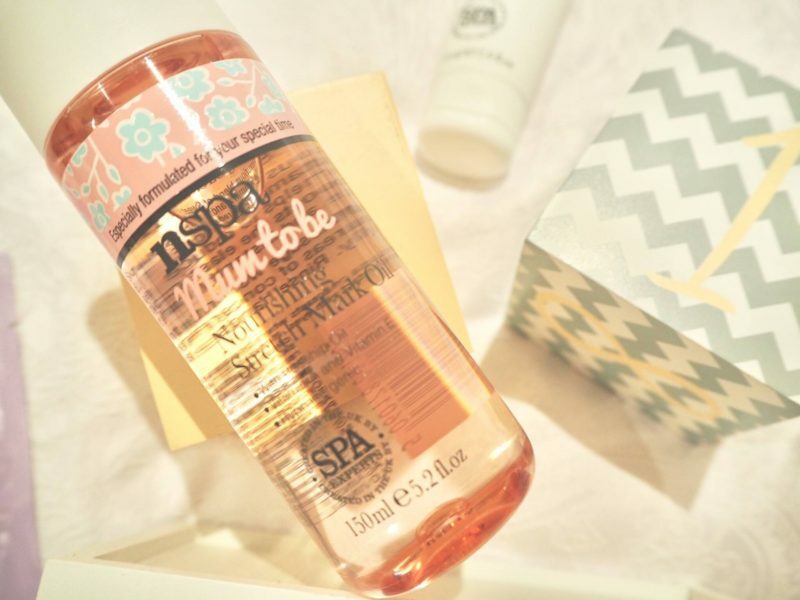 We both had mini treatments which left me wanting more. 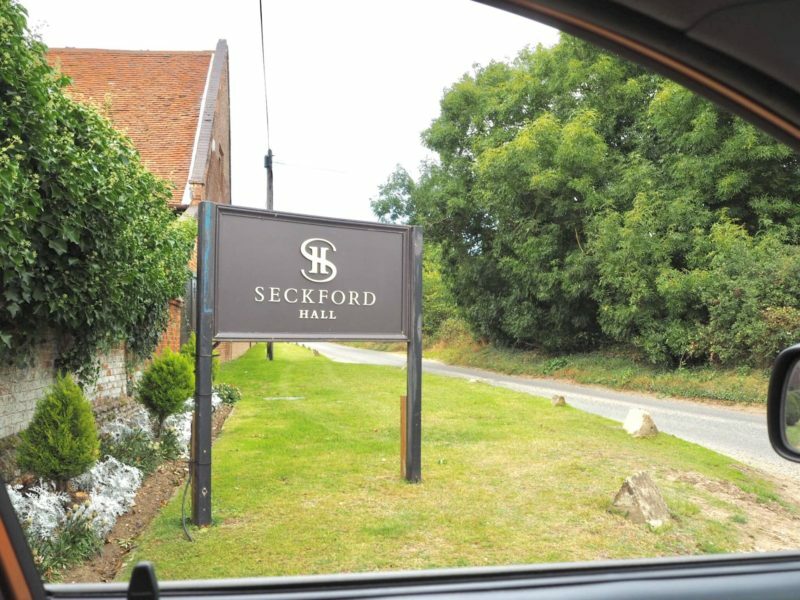 So, I went back by myself a few weeks later after being kindly invited to try the New Beginnings pregnancy massage at Seckford Spa Suffolk. 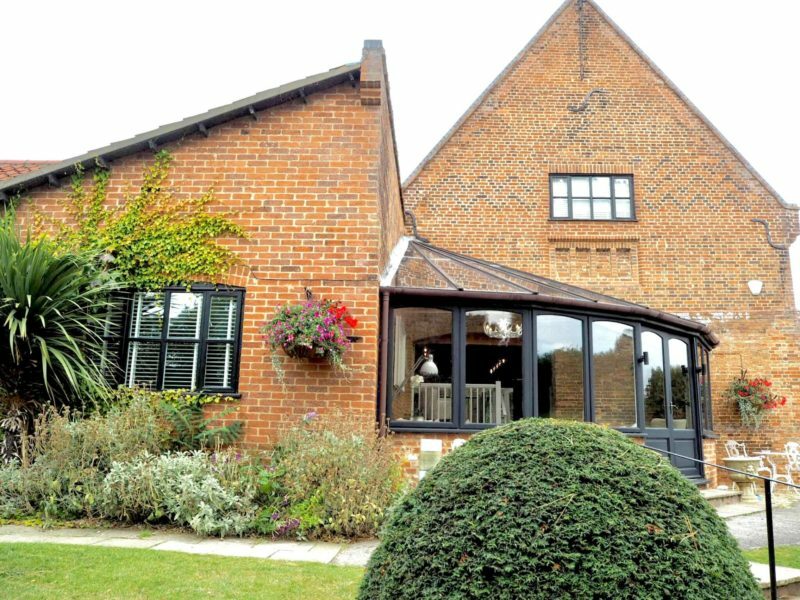 This spa is located just outside of Ipswich so not far at all from my mother’s doorstep. Since I’ve been spending most weeks in Suffolk, I made the appointment soon after my previous visit. The spa is so lovely with an honest country feel. 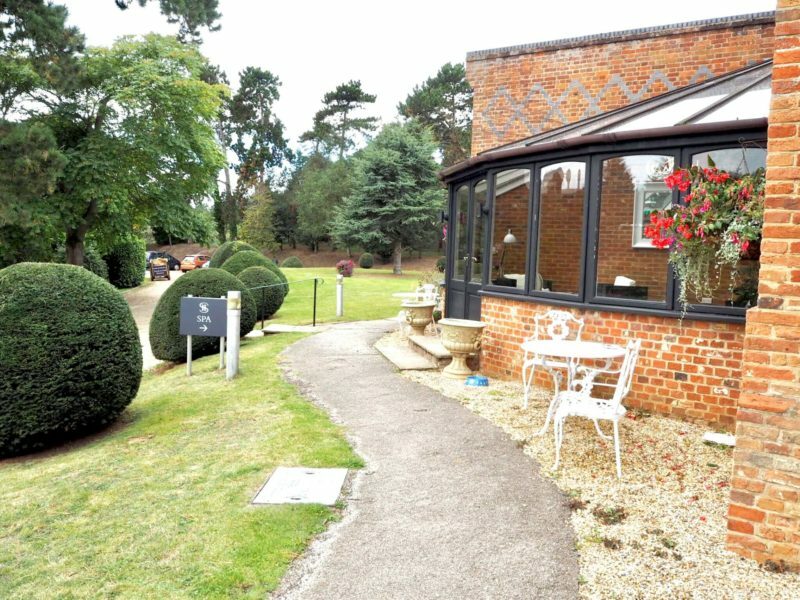 The conservatory is a place where you can sit back and have a tea and cake if you’re not a spa goer and just watch the world go by. 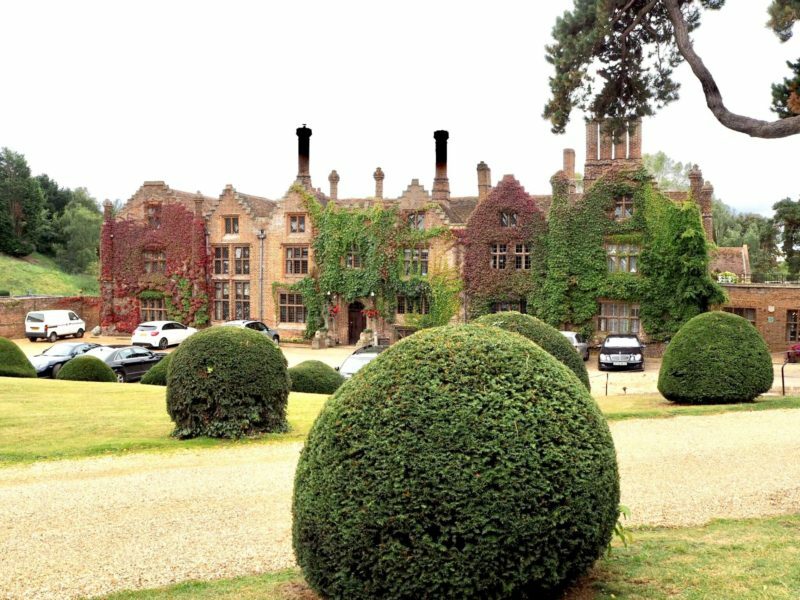 Many weddings take place at Seckford Hall, and it’s not difficult to see why from the stunning facade and views. The swimming pool, sauna and jacuzzi are located on the ground floor of the spa, while all the beauty treatments such as massages, pedicures and facials are on the floor above. 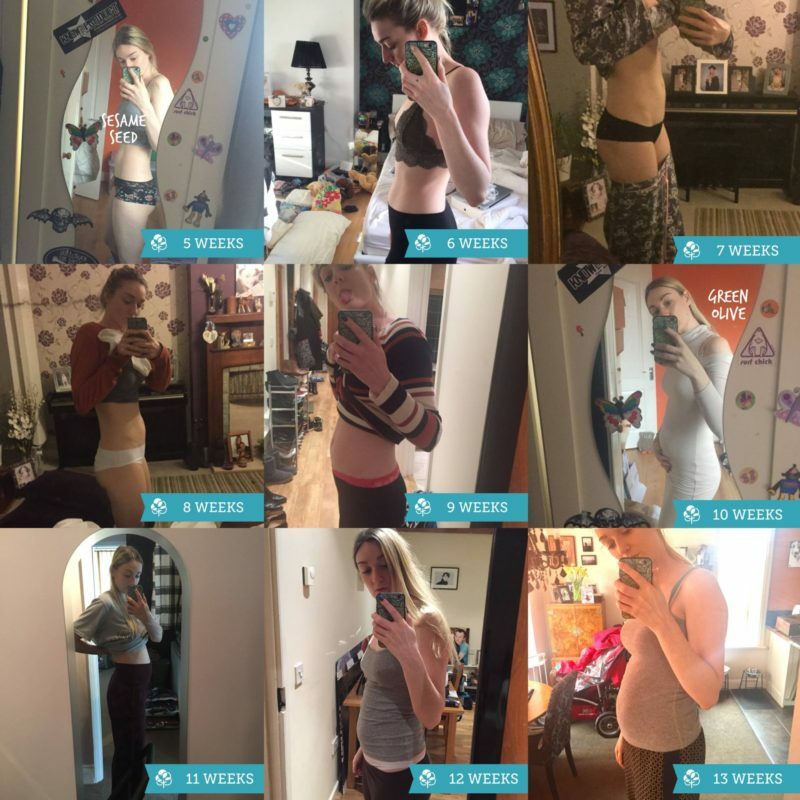 The ‘New Beginnings’ treatment (£60) is suitable for pregnant women who are 16 weeks and over- I was definitely over this point last month! 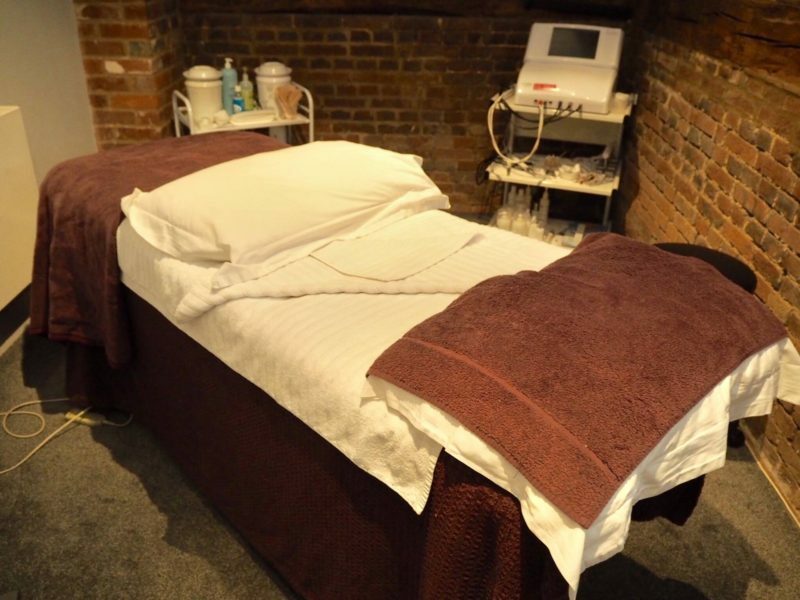 The treatment is designed to help restore balance and, much like all massages, helps to relax the mind and body. For the treatment, I lay on both sides to allow my masseuse access either side of my body in turn. She focused on going from my shoulder down to my upper leg, then repeated on the other side. I had a pillow between my legs, as is natural for most pregnant women to feel comfy when laying this way. We moved onto the lower legs and feet which I just loved- it’s tough not being able to reach that far down anymore! I was on my back for this, though you can have the bed adjusted so you are more propped up if you get short of breath or dizzy if horizontal. The last part was my neck and shoulders- we put some oil on the belly too but you don’t have to if you don’t want to. 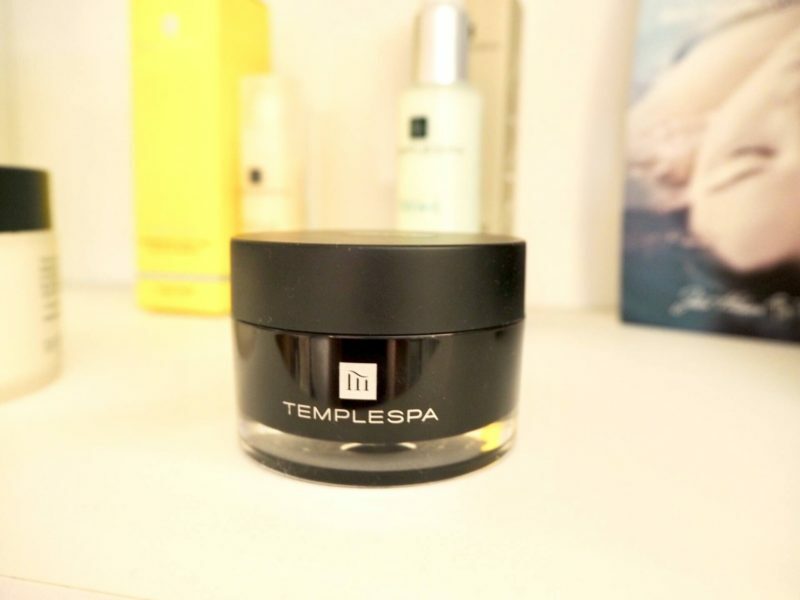 The products used were from Temple Spa- I loved the aromatherapy resting cream called ‘Repose’ (£40) used at the beginning and end of the treatment. 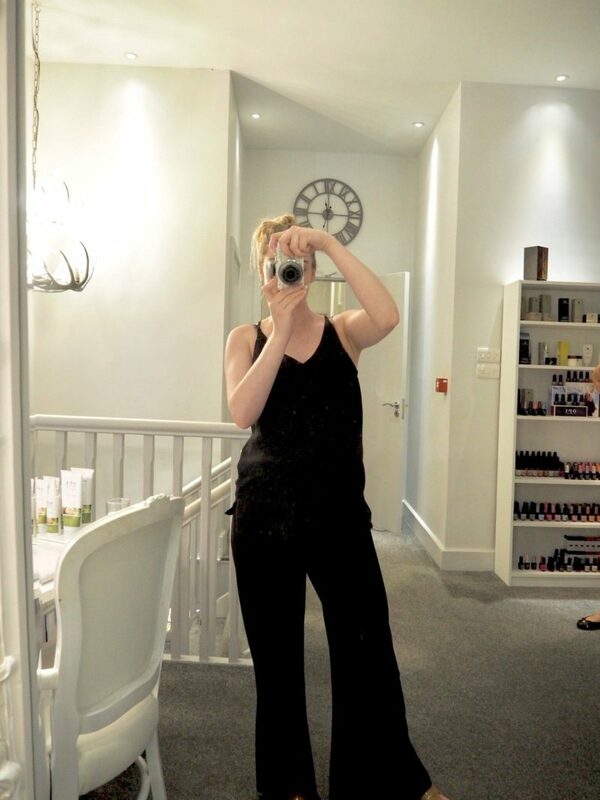 The New Beginnings pregnancy massage at Seckford Spa Suffolk was a much needed piece of bliss. 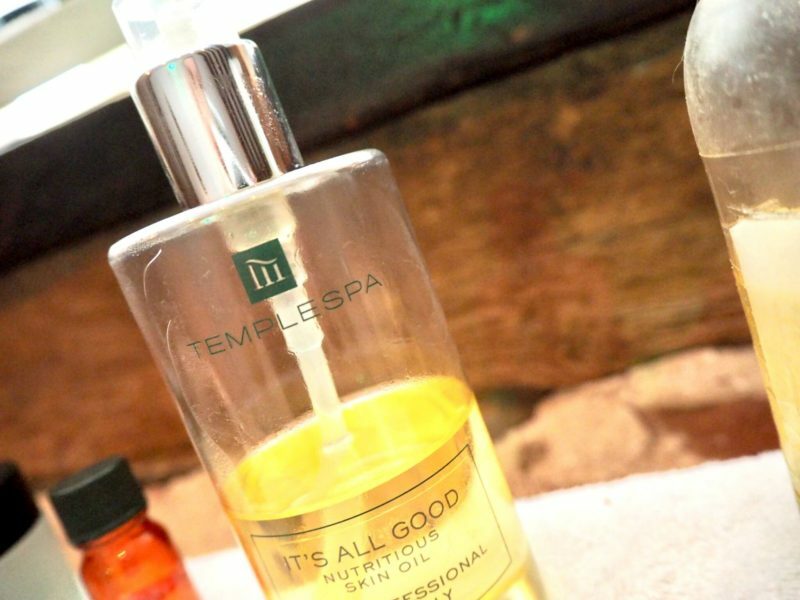 If you are searching for a great spa around East Anglia that offers treatments during pregnancy, this one should be top of your list to try! Now the final stretch is in sight, I want to thank all my friends, family and readers for being there in the form of a text, tweet and visit throughout my pregnancy. Blobby, it’s been real, but seriously now, get out! 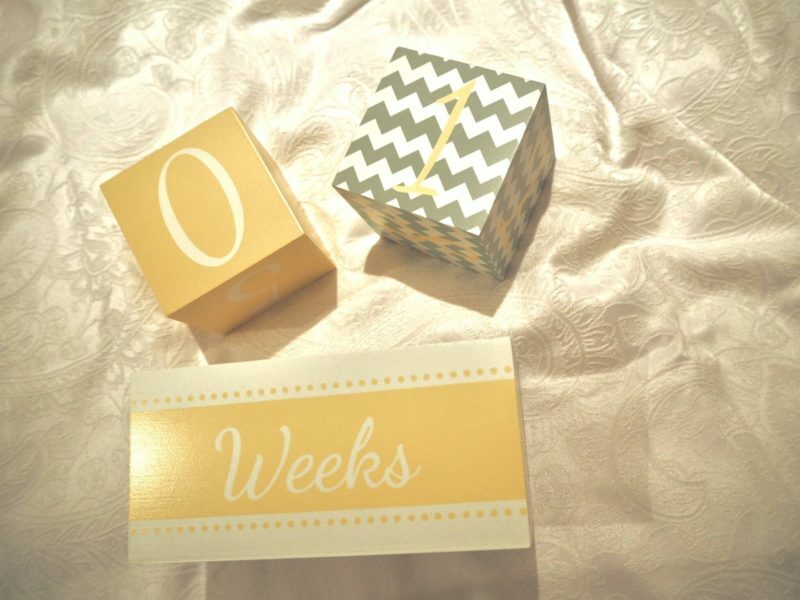 Those final days of pregnancy are to be frank, pretty crap. 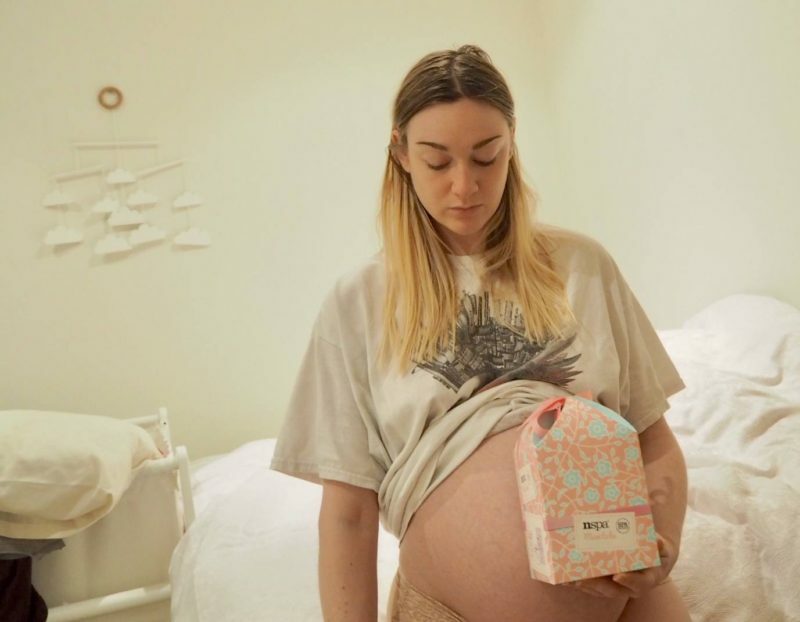 Not just because you’re feeling tired, stressed out, unprepared and all of the above already- what makes things even worse is if you think you have an idea on when your baby will arrive, and then it doesn’t. It’s a crazy time, you’re about to enter an unknown world with a million possible outcomes you just cannot predict. 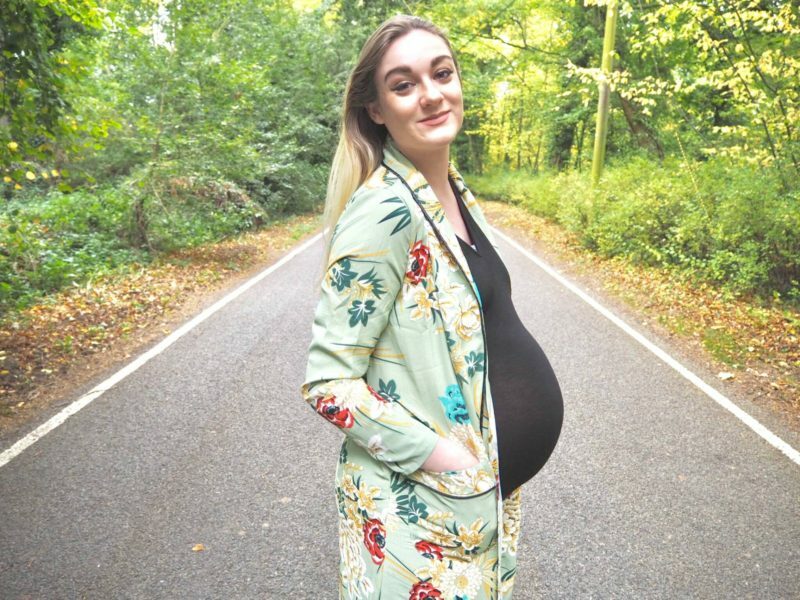 Worries of ‘will my baby be healthy and normal?’ are floating around in your head and you just can’t push the doubts of ‘am I able to do this?’ from your mind. I have found my pregnancy to be a fairly good one up to this point, but I’m ready to admit that I am just a little bit fed up now. I’m sleeping well and eating great. No issues in any way health wise. The only problem is, it’s the anticipation that’s really getting to me. I don’t know if my waters will break at any moment, or if I’ll be needing to make an appointment next week to kickstart things once I reach the overdue stage. 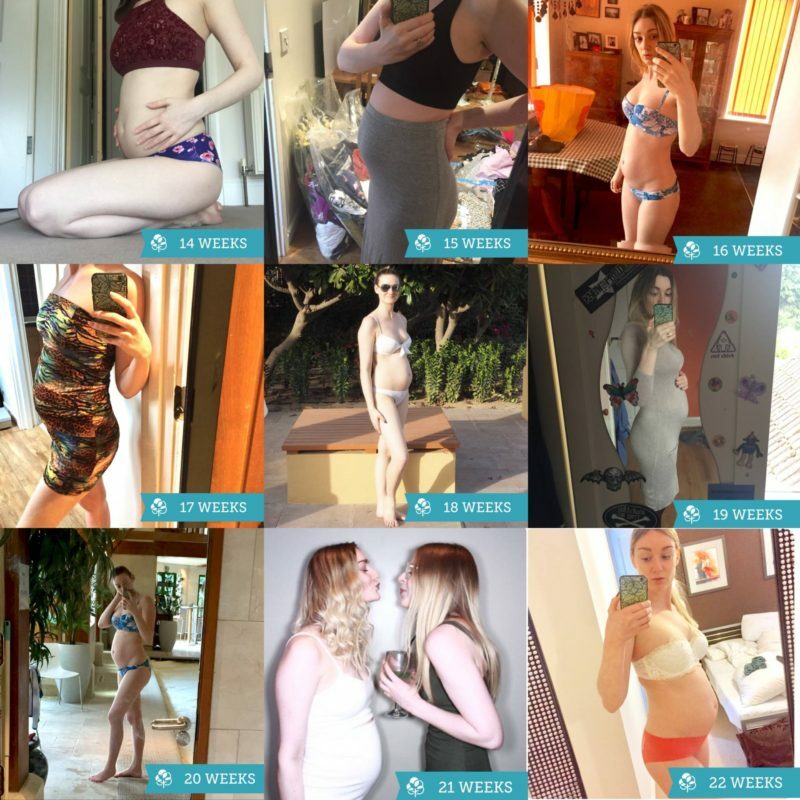 I have been telling myself for 8 months that I won’t go past my due date, and that’s part of the reason why I think I’m starting to get disheartened with only a few days to go till I reach the 40 week mark. 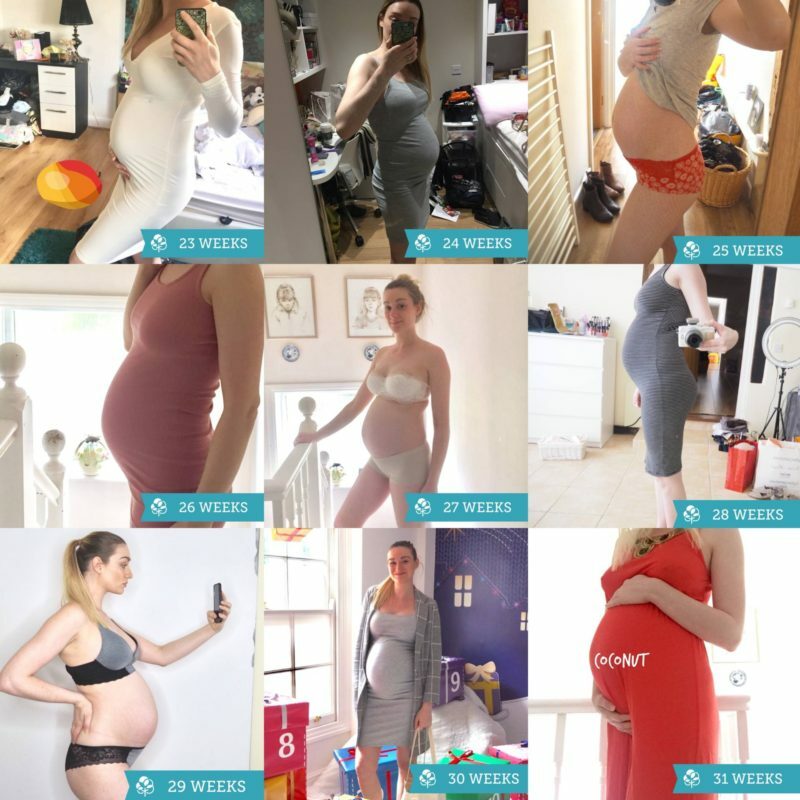 So, while I have frequent meltdowns and shout at my sister for no reason, I thought it would be a good idea to talk about the importance of making as much time as possible for yourself in those final days of pregnancy. 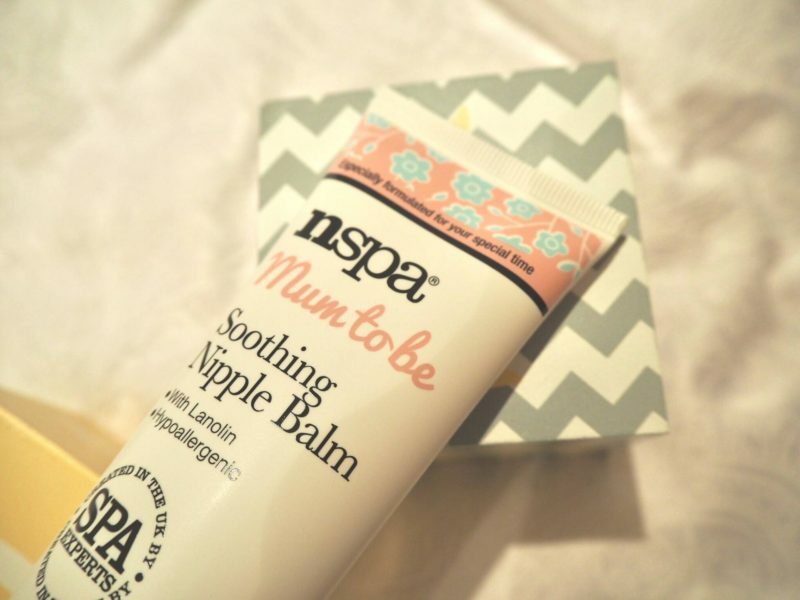 The nspa mum to be collection has been created for your special time (goodness knows I need it this week!). The collection of naturally inspired cruelty free products will help take care of the changing needs of your skin not only during pregnancy but as a new mum too. 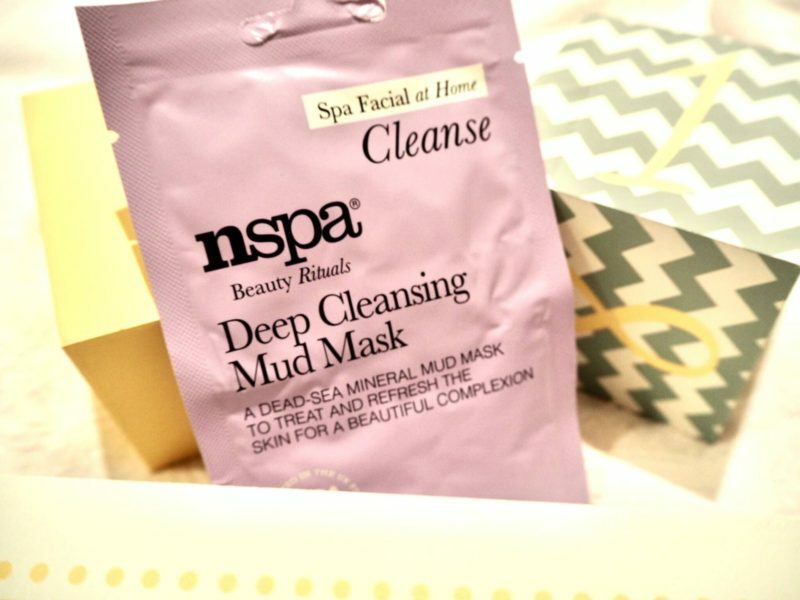 Taking the time to relax and de-stress is key, as is ensuring your skin is kept silky soft, supple and in great condition throughout your pregnancy and beyond. 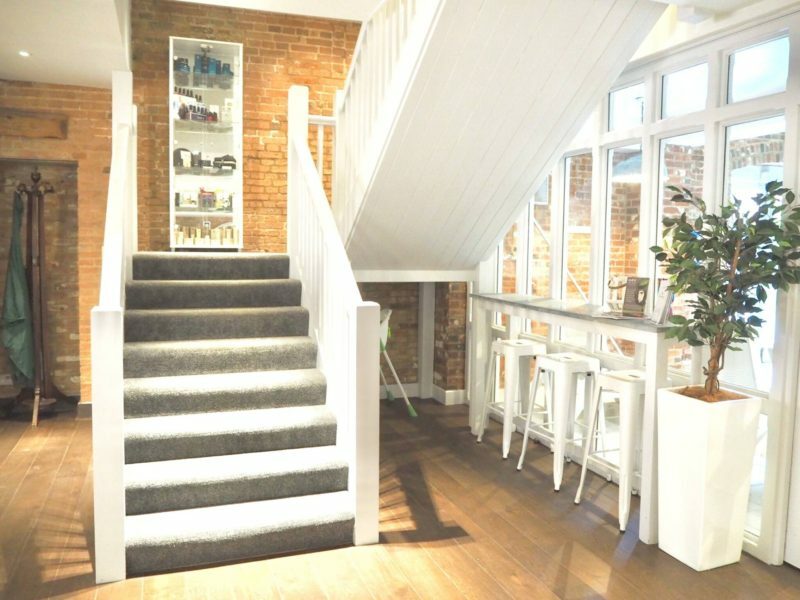 Not only does the range allow you to look after your skin during this life and body changing time, it also provides an escape that you can count on to help your inner well-being. I have found that time to myself with my baby is so important. Bonding with your growing baby while it’s still living inside you is a useful tool to keep your mind strong and focused before labour begins. 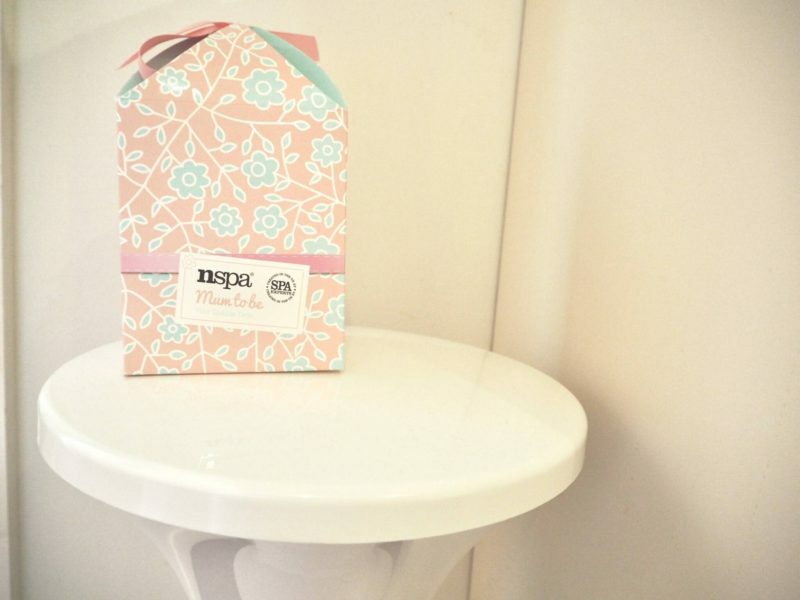 The aromas from the nspa beautiful mum gift box have really helped me during those final days of pregnancy. Keep your fingers crossed for me that this baby arrives before my due date! If you have any more tips then leave them in the comments below!